Who would have thought it? A British romantic comedy with zombies in it, or a “romzomcom” as the makers of Shaun of the Dead has it. Shaun is a North Londoner stuck in rut: his sales assistant job is a dead end, and his girlfriend keep nagging him that all they seem to do is spend time at the Winchester, their local pub (they do). The biggest albatross around his neck is however Ed, his best friend, a fat slob of a slacker who stays at home all day playing computer games – ah, the joys of the British welfare system . . . In the meantime, a virus is busy slowly infecting everyone around them, turning them into zombies of the classic George Romero/Night of the Living Dead type, not the fast ones we saw in 28 Days Later and the recent Dawn of the Dead remake. The joke is of course that the central characters are too self-absorbed to notice what is happening around them – personally I suspect that a lot of people won’t notice if their city is taken over like in this movie or the 1970s remake of Invasion of the Body Snatchers. However, things soon come to a head as Shaun has to take responsibility of his life in order not only to survive, but to rescue his girlfriend and her friends as well as his mother (named Barbara) from the impending zombie onslaught. “We’re coming to get you, Barbara,” his fat slob of a friend promises her over the phone. If you caught the above quip, then you’ll probably enjoy Shaun of the Dead more than your fellow cinema patrons. (Another in-joke: a restaurant Shaun can’t get a reservation for is named Fulci’s.) Unfortunately Shaun of the Dead doesn’t quite live up to its advance hype: the movie takes its time to kick off and when it finally gets going (with the appearance of the zombies) it never reaches the delirious over-the-top zaniness of something like, let’s say, Evil Dead 2 or Army of Darkness. The movie has its laugh-out loud funny moments, sure, but the comic bits are far in between the plot requirement bits. Still, the acting is good and the special effects are neat for such a low-budget affair, but the movie can never strike the right balance between its horror and comedy bits and what it lacks is a general sense of over-the-top exuberance to turn it into something one can recommend unreservedly. It's a fun outing, but somehow never really takes off . 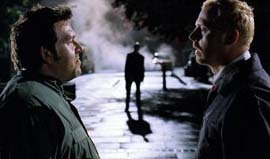 . .
Read a review of Shaun of the Dead on DVD.